Assessing the accuracy of the SIRAH force field to model DNA at coarse grain level. We present a comparison between atomistic and coarse grain models for DNA developed in our group, which we introduce here with the name SIRAH. 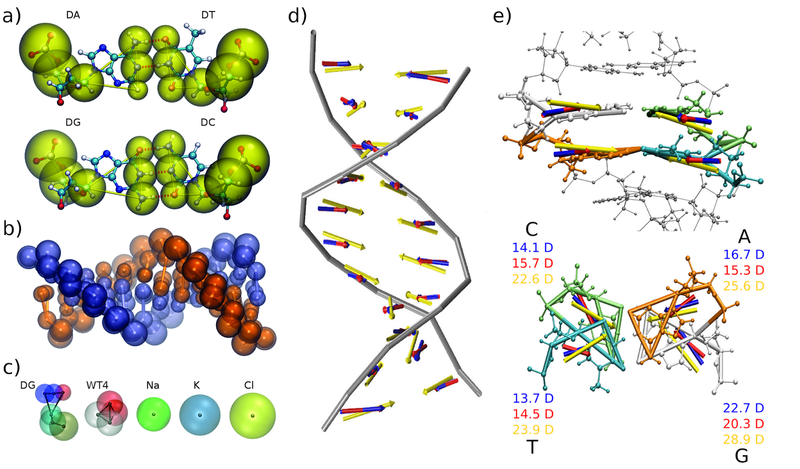 Molecular dynamics of DNA fragments performed using implicit and explicit solvation approaches show good agreement in structural and dynamical features with published state of the art ato- mistic simulations of double stranded DNA (using Amber and Charmm force fields). The study of the multi-microsecond timescale results in counterion condensation on DNA, in coincidence with high-resolution X-ray crystals. This result indicates that our model for solvation is able to correctly reproduce ionic strength effects, which are very difficult to capture by CG schemes.